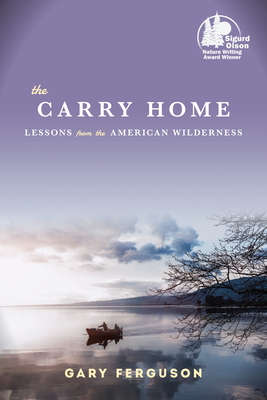 The Carry Home: Lessons from the American Wilderness (Paperback) | Eagle Harbor Book Co.
After Ferguson’s wife dies in an accident while canoeing—the very act for which they both shared a great love—he embarks on a journey to scatter her ashes in five wild locations they both loved. What follows is an intimate look at one man’s relationship to the land, and how that influenced his relationship with his wife. Unsurprisingly, he has a keen eye for describing the world as he paddles and hikes through it, but equally poignant are his descriptions of grief, love, and his human relationships. A soulful book, beautifully written. This story of love and loss and a promise kept is exquisitely told and a joy to read. A powerful account of love and landscape, this was the most moving book I read in 2015. The nature writing of Gary Ferguson arises out of intimate experience. He trekked 500 miles through Yellowstone to write Walking Down the Wild and spent a season in the field at a wilderness therapy program for Shouting at the Sky. He journeyed 250 miles on foot for Hawks Rest and followed through the seasons the first fourteen wolves released into Yellowstone National Park for The Yellowstone Wolves. But nothing could prepare him for the experience he details in his new book. The Carry Home is both a moving celebration of the outdoor life shared between Ferguson and his wife Jane, who died tragically in a canoeing accident in northern Ontario in 2005, and a chronicle of the mending, uplifting power of nature. Confronting his unthinkable loss, Ferguson set out to fulfill Jane's final wish: the scattering of her ashes in five remote, wild locations they loved and shared. The act of the carry home allows Ferguson the opportunity to ruminate on their life together as well as explore deeply the impactful presence of nature in all of our lives. Theirs was a love borne of wild places, and The Carry Home offers a powerful glimpse into how the natural world can be a critical prompt for moving through cycles of immeasurable grief, how bereavement can turn to wonder, and how one man rediscovered himself in the process of saying goodbye. Over the past twenty-five years Gary Ferguson has established himself as an expert chronicler of nature, having written for a wide variety of publications from Vanity Fair to The Los Angeles Times. He is the author of nineteen books on science and nature, including the award-winning Hawk's Rest. He is also a highly regarded keynote speaker at conservation and outdoor education gatherings around the country and is currently on the faculty of the Rainier Writing Workshop Masters of Fine Arts program at Pacific Lutheran University.